A lifelong Waltham resident, Dave Fox is well-known for his expertise in both teaching and performing. A father of two young girls, Dave is a patient teacher who is confident in teaching students of all ages. 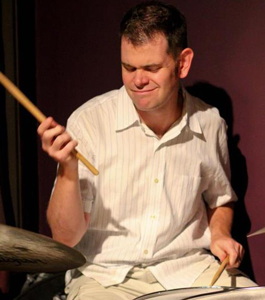 Boston’s Dave Fox is a drum set artist and educator who’s become a staple on the local music scene and a first call sideman to many of Boston’s top Jazz, Funk, Rock and Blues musicians. He also has worked with national artists such as Grammy Award winner Charles Neville (of the Neville Brothers) and Grammy Award winning songwriter, producer and musician Tom “T.H.” Hambridge. Dave is also the creator and leader of the experimental, free group “Adventures In Sound” featuring world class improvisers David Tronzo, Phil Grenadier, Josh Rosen and Bruno Raberg. In addition to performing and recording, Dave stays very active in the field of marching percussion education and is the director of percussion for both the fall and winter marching programs at Blackstone-Millville Regional High School in Blackstone, MA. Since 2004 has been a member of the Vic Firth Education Team as a Marching Percussion Specialist. He has had the privilege to study with master percussionists such as Walter Tokarczyk, Thom Hannum, and Billy Ward and has been a long time student of Bob Gullotti. He is an endorser of Pearl Drums and Vic Firth Drumsticks exclusively.